Splinter Cell Producer Calls Conviction a "Rescue Job"
Producer, Maxime BÃ©land, promises Splinter Cell: Blacklist will have more content for sneaky players. 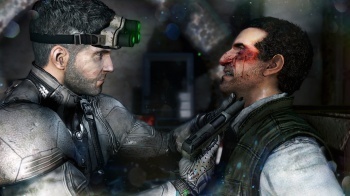 Splinter Cell: Conviction launched to a warm critical reception (former Escapist editor-king, Russ Pitts, certainly liked it) and went on to be the second best-selling installment in the series. However, the game's focus on action, and gunplay in particular, left quite a few old-school stealth fans out in the cold. While previous Splinter Cell games encouraged an array of playstyles with varying degrees of dakka, Conviction really only allowed one, and that may be down to the game's troubled production. "I'm not going to go into the whole story, but Conviction was kind of a rescue job for me," producer, Maxime BÃ©land, told Joystiq. "It wasn't going well. We changed the direction and kind of shipped the game in two years. So Conviction is very sweet and sour for me." According to BÃ©land, Conviction was little more than a "stepping stone" towards Blacklist, which will be more accommodating to non-murderous players. He went on to describe the three player archetypes his team is trying to cater to: The "ghost player" who doesn't want to kill or be seen, the "action/tank/killer" who wants to charge through the levels like a gravelly voiced Rambo and "the panther" who strikes a balance between the two. Shortly after the release of Conviction, BÃ©land and his team went through the reviews of the game, marking which features reviewers hated and which they liked. The black-and-white filter applied when Sam entered the shadows was almost universally scorned, so that's out. The game was also knocked for being too short and too small, so expanding the story and the levels was a high priority for the team. The much-adored spy vs. mercs competitive mode is also making a comeback, which BÃ©land described as "the easiest decision of [his] life." While the recent gameplay trailers for Blacklist have struck a fine balance between shooting and sneaking, I'm not sure how any Splinter Cell game can truly work without the dulcet tones of Michael Ironside.